The 306 horsepower Honda Civic Type R was one of the most eagerly anticipated new cars in years. It’s billed as the ultimate front-wheel-drive track weapon, but is it really? This team is building a Type R into a race car to find out. Team HMA—for Honda Manufacturing of Alabama—is the newer, wackier sister-team to the Ohio-based Honda of America Racing Team (or HART, for short). While HART may be tackling some of America’s most legendary endurance races this year in an Acura NSX GT3, Team HMA’s projects are more accessible to the average hoon. HMA built a race car out of a Honda Odyssey minivan, raced a Honda Accord coupe in Pirelli World Challenge, and ran One Lap of America in an Acura MDX crossover. Other past racing projects include an Accord sedan and a Honda Pilot. It’s the kind of nutty stuff we love to see: cars made for something else completely showing up on a race track anyway. Now, they’ve shifted their attention to something a bit more conventional, but absolutely necessary since everyone wants to see it on a race track: a new Civic Type R, freshly plucked from Honda’s press fleet. Perhaps the coolest thing about what Team HMA is doing is that it’s all going to be homologated through Pirelli World Challenge as an approved set of modifications for the TC class there. They want other teams to buy those same mods and take the Civic Type R racing. Unlike the Civic Type R TCR car, which comes already race-prepped, has a few more custom features and costs substantially more up-front, Team HMA’s TC-class Civic Type R is something you could build yourself. Like HART, Team HMA is an all-volunteer effort across Honda’s Alabama facility. No one gets paid extra for being on the team, although they do get to use Honda’s equipment to prep the cars, and the team itself gets some financial support, parts and cars from the company. There are no prior requirements or tryouts for joining the team, either. Team HMA member Karl Hertel says that they just want folks with enthusiasm for the project and a willingness to work. Most team members come from the engineering department and some came with prior racing experience, but they can be from anywhere in the company. One team member, for example, works on the assembly line. Even if you have no experience, there’s always small jobs that need doing, like cleaning and organizing parts, and you can gradually get bigger and bigger roles in the team as you learn. HMA had been looking for something new after running their Accord in Pirelli World Challenge for the past three years. The fact that everyone on the team works for Honda put them at an advantage when it came to developing race parts for the Type R.
The good thing about being based in Alabama is that Barber Motorsports Park is right there. To get an idea of what they needed to do, Team HMA brought an ex-media car Type R to the track to see what it could do, and what needed to be improved. 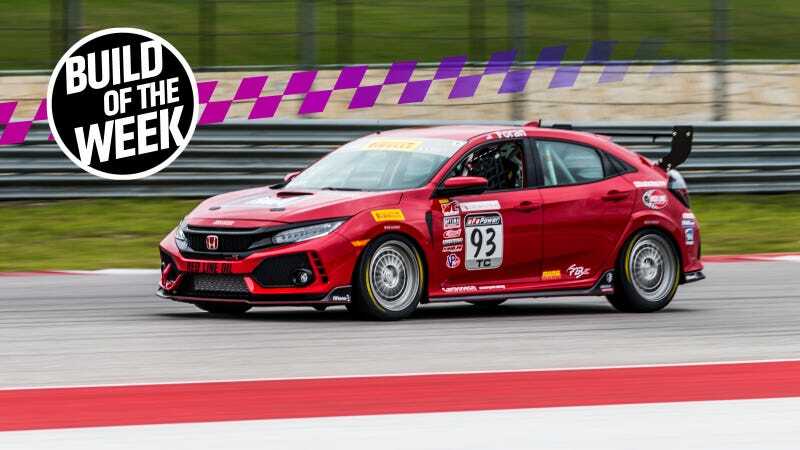 Bone stock, on its not-so-gently-used stock tires and brakes, the Civic Type R was just four seconds a lap off of the lap time of their old, fully race-prepped Accord Pirelli World Challenge car. That’s good, because they planned to start racing it this year, and just got the car last December. Road cars, however, are always going to be a bit of a compromise. Nice track suspension is usually too stiff for bad potholes, for example. Other parts, such as the cross-drilled rotors that come stock on the Type R, aren’t made to withstand the extra heat, wear and tear of a whole race’s worth of laps. Gutting the interior for roll cage installation. The team started working with Honda Performance Development on some of the more custom modifications that had to be developed to build a race car out of a formerly roadgoing Type R. Because it was a new car getting homologated for the series, roll cage designs had to be sent back and forth several times before they were ultimately approved. The build moved fast after the car came back fully caged just a month and a half before its first race at Circuit of the Americas. Team members who spoke with Jalopnik during the World Challenge weekend said that they were working sixteen-hour days in the last couple weeks before the race—either eight hours at work, and eight on the car, or a full sixteen hours on the car if it wasn’t a work day. The differential up front was swapped out for a more race-tuned clutch-type limited-slip differential. 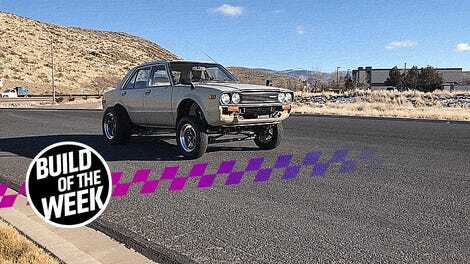 The stock one is designed more for good, spirited drives, and with the car’s traction and stability control systems that would be turned off for the race car. Like most street differentials, this stock diff allowed more wheelspin on the inside tire. The new 1.5-way limited-slip diff locks in power to both wheels on acceleration and partially locks the car’s two wheels together on deceleration to use more of the car’s power when they need it. While the engine was out, they took it over to Mark House at the paint department at Honda, who sprayed the interior in a bright white—good for both keeping things cool and seeing any small items you drop. The dashboard, which had been taken out along with the rest of the interior when the roll cage was installed, had to be modified to fit around the roll cage. This was particularly tricky, as the team wanted to have quick access to modules tucked in behind the dashboard, and with a new dash bar for the roll cage in the way, a lot of rearranging had to happen to make it all fit in a way that makes sense for a race car. The series-mandated Motec data system went in, along with other common race car items, like a fire system, kill switches, Cool Shirt box for driver cooling, and radio system. The completed, installed dashboard...for the moment, anyway. One team member, Michael Gordon, made an entire Amazon list just based on all the car’s electrical needs. Another teammate, Kelvin Murphy, took charge of putting all these systems back together. Murphy told us that he “lost count” of how many times he took apart and reassembled that dashboard. Of course, the highly connected modern electronic systems in the Civic were probably the toughest part of the build. Sometimes they would take something out, like the active dampers, and the car would freak out as there was nothing getting plugged back into that place. Having access to the internal design drawings of the car itself at Honda was a big help or tracking down and fixing these gremlins. An ABS issue where the car would send more braking force to the wrong wheels, for example, was fixed after they discovered that the lines were switched somewhere along the way. The scariest moment of the car’s build, however, came thanks to a broken turbo stud just three days before they had to leave. The team had to machine a couple small things like bushings on the car in the process of making it into a race car, but the thought of drilling down the center of the stud on a brand-new turbo was the most nerve-wracking task they attempted. When welding a nut onto the stud to try wrenching it out didn’t work, they had to machine it out with a Bridgeport mill. They were able to clean up the threads after that, though, so it worked! This roll cage bar made getting in and out of the car difficult. After things were mostly back together, the driver’s seat was installed using a sliding seat base and seat brackets from Procar Innovations that bolted directly into the Type R’s stock seat mounts. This slider was key in letting the driver get in and out of the car easier, thanks to a rollcage bar that’s sort of in the way when the car’s up in the position to drive. Custom suspension arms, sway bars and bushings from RV6 came at the last minute, overnighted right before the team left. These all let them fine tune the suspension a bit more than the stock components. A Borla race exhaust was also added onto the car. A set of non-holey Girodisc two-piece rotors went in the stock front rotors’ place place, along with race-compound Carbotech pads at all four corners. Carbotech even sent over a second compound to Circuit of the Americas in case the team couldn’t sort their ABS issues, knowing that they were down to the last minute. Another supplier, United Speed Racing, sent braided steel brake lines and a turbo blanket for the car, and even helped put the engine back in. Jason Owens at United Speed Racing has been tracking his own Type R, so they were all about pitching in. It was a race down to the, well, race to get the car ready to run, though. The stock active dampers were replaced with simpler, lighter, non-active Bilsteins, which arrived at Circuit of the Americas on the race weekend. The rear dampers carried over from the Civic Si, but the front ones were new designs for the Type R race car build, and had to have custom brackets made to fit. These new dampers allowed the team to tune bump and rebound independently, unlike the stock system. The fifteen52 wheels arrived just before the race, and race tires only got mounted right before the second practice session. That second session—since they missed the first one—was the first time the car ever went on track as a race car. Gee, I wonder how the adjustable end rods bent? The team described this weekend as a bit of a shakedown because of the lack of run time they got in before it raced. It’s the first turbo car they’ve ever raced, a completely new car on top of that, and they’re still getting familiar with it. As such, they discovered a few things they’d need to fix. “Pirelli [World Challenge] wants [the Civic Type R] kind of stock right now, and they will tune it as they see the performance of the car and how it stacks up against the other cars,” Hertel explained. A fuel cell will need to go in in place of the relatively small 12.4-gallon stock fuel tank so the car to go the entire distance of the race. They ran out of gas in their first race, and a bit of fuel saving got them to the end of the second race but the fuel cut out on the last lap. Also, the adjustable end rods on the Type R’s suspension bent on track, forcing them to realign the car several times during the weekend and ultimately add a reinforcement to that end. A blown passenger right rear damper caused a fender rub in the front during the first race, but driver Josh Foran set the fastest lap of the weekend anyway on it. They also plan on getting a new carbon fiber main plane for the rear wing, as the one they were using this weekend was taken off the Accord—and still had the attachment points for the Accord hanging there. Attachment points on the main plane of the wing for use on the the Accord. Pirelli World Challenge brings out a bunch of big-budget, well supported racing efforts, but to me, the most interesting ones are hanging out under smaller canopies at the edges of the paddock. Team HMA’s space didn’t look much larger than many club racing paddock spots, with no fancy catering line or plastic floor laid over the asphalt. TC still attracts regular cars built up for race duty, like the Civic Type R, Genesis Coupe, Nissan 370Z. Cars regular people buy and take to the track. You, a non-trust-fund-kid, could probably save up, maybe even find a few sponsors and race here if you really wanted to. These cars exist less in a fantasy land fenced-off by unobtanium, and closer to reality for most race fans. That’s also why the car Team HMA is developing for the series is so interesting. It’s not a one-off franken-race car where the mods are top-secret bespoke components you can’t have. What they’re developing now will be available to anyone wanting the parts to build a TC-class Civic Type R. If you have a tenth-generation Civic and want to make it more capable on track, it’s worth paying attention to what they’re up to. The team posts frequent racing updates for whatever they’re doing—be it racing the Type R or stripping out a minivan for a lap time comparison at Gridlife—on their Facebook page here. The Jalopnik bump at work: the Type R survived two races and didn’t finish last—no small feat with an unproven car. Using all the space they can in the car to leave, as Team HMA had a single-car trailer with only a little extra space for tools and spares. Team HMA’s lead mechanic passed away last year, so the team honored him with a sticker on the car.